Mazda MX-5 25th Anniversary limited edition unveiled | What Car? 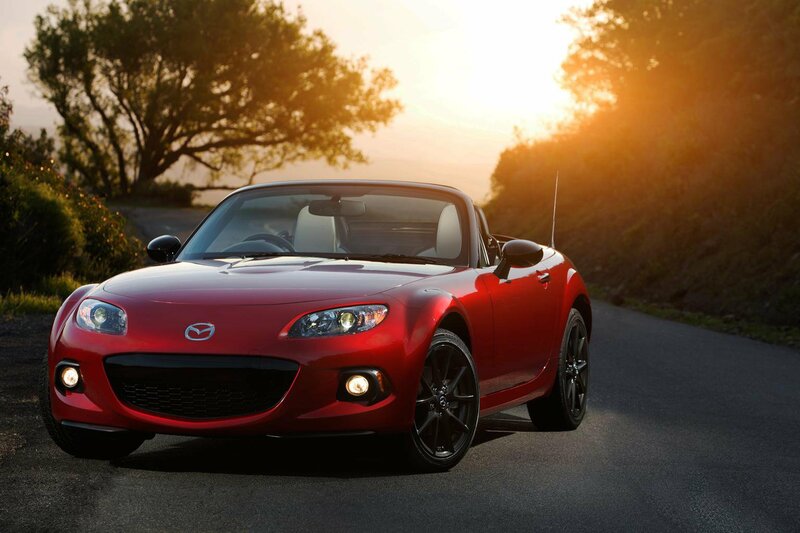 A 25th anniversary version of the Mazda MX-5 will go on sale in August. The MX-5 Roadster Coupe 2.0-litre 25th Anniversary Limited Edition is based on the Sport Tech Nav model, and gets a selection of bespoke visual upgrades inside and out. All of the Limited Edition models will be finished in a dark red metallic paint, with black door mirrors and windscreen pillars, and a powered roof. It also gets dark grey 17-inch alloy wheels, a rear diffuser and a chrome exhaust trim, while every car gets individually numbered badging. Inside, it gets heated leather seats with red stitching. The stitching is also available on the steering wheel, gearlever and handbrake, while the headrests get 25th Anniversary logos. The MX-5 also gets a dark red dashboard panel, black rollover bar covers and stainless steel scuff plates. A 6.1-inch touch-screen navigation system with Bluetooth and USB connectivity is fitted as standard. The 2.0-litre, 158bhp petrol engine is the same as in the standard MX-5. It gets from 0-62mph in 7.9 seconds, has a top speed of 136mph and emits 181g/km of CO2, with an official fuel economy of 36.2mpg. There will be 1000 of the Limited Editions released worldwide, with 750 coming to the UK. It will make its official public debut at the Goodwood Festival of Speed from June 26-29, where pricing will be confirmed before it goes on sale on August 1. It is expected to cost in the region of £23,000. The next-generation Mazda MX-5 is due to be revealed next year, and is set to get a much more radical look than the current car. When is the best time of the year to buy a convertible?